I had a question in the comments section last week about the ability of the Ninja Blender to make tomato juice. And while I was very confident that the Ninja could produce tomato juice with ease, I thought I’d do a little demonstration for you. And, to make it more interesting, I decided make a tomato blend. Instead of,“Could’ve had a V8,” I ask, should you have a V8? Eh, I really don’t think so. 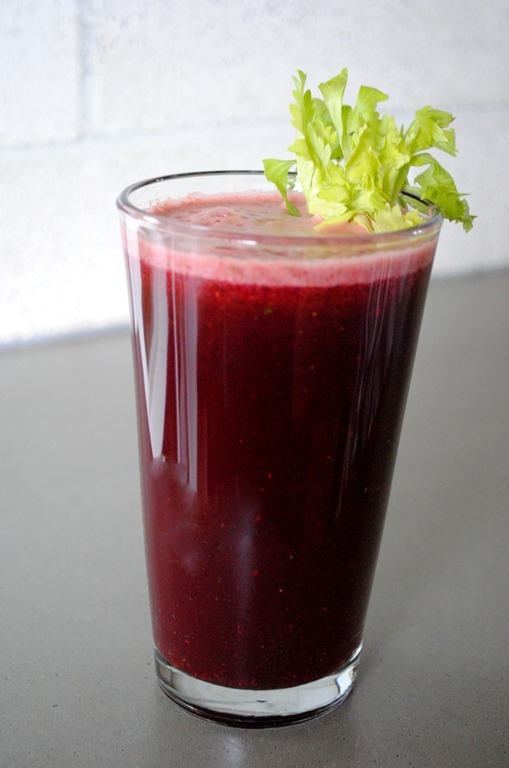 Ingredients: Tomato Juice from Concentrate (Water, Tomato Concentrate), Reconstituted Vegetable Juice Blend (Water and Concentrated Juices of Carrots, Celery, Beets, Parsley, Lettuce, Watercress, Spinach), Salt, Vitamin C (Ascorbic Acid), Flavoring, Citric Acid. While this ingredient list doesn’t look terrible, in reality, there are far better ways to get your vegetables. 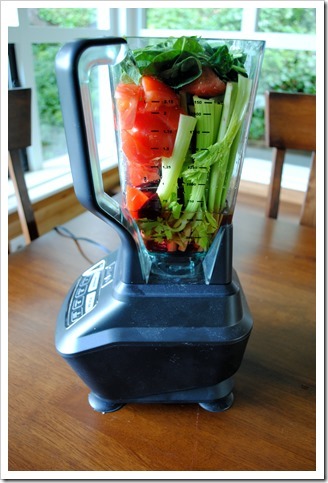 And, if you want to have juice as part of that, I’ll show you how you can easily whip up your own tomato juice blend in your Ninja Blender. 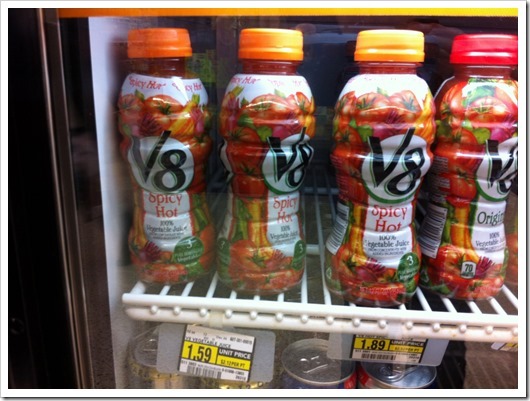 The bottom line is that V8 juice is not fresh, it’s made in a factory, and it’s packed with salt to make sure you like it. 620 mg per 8 ounces of juice is HUGE. That’s 25% of your RDA in a small coffee-cup sized serving. Who cares if you’re getting “two servings” of vegetables in the little cup, you’re also getting 1/4 of a teaspoon of salt to go with it! While price isn’t really part of the overall discussion, when I went to the store to buy the ingredients for this juice, they ironically had the V8 front and center. 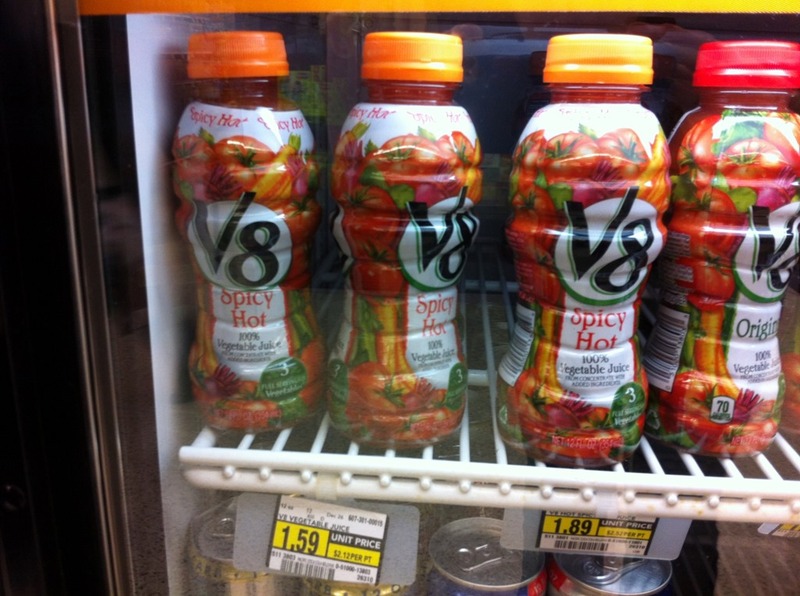 Original V8 was $1.59 and Spicy was $1.89, for a 12 ounce bottle. I should note that this was at an Albertson’s in the Seattle suburbs. Not terribly expensive in the juice world, but then again, it’s not “fresh’” like a more expensive fresh-squeezed juice that you’d buy at a natural market. 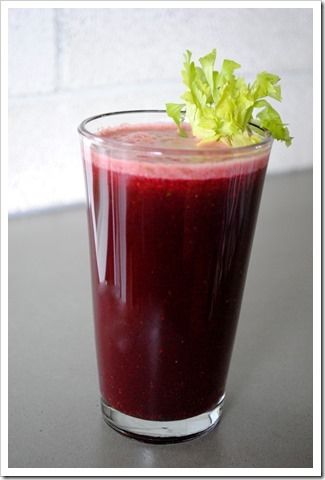 All that said, what if you like V8 juice and you want to make your own? 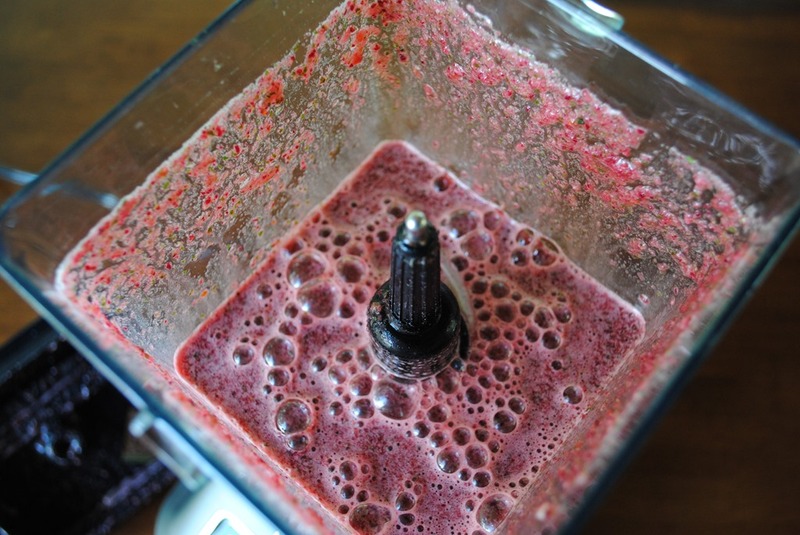 Well, it is easier than you might think if you have a high-powered blender (or a juicer). 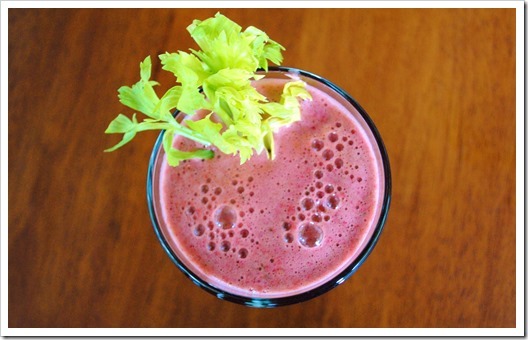 I don’t have a juicer, so, let’s talk about how to make this in your Ninja Blender (or similar). The end result is refreshing, with no added sodium, and you can really tailor to your tastes. I have provided a framework below of a juice that I like, but, oh wait, what’s that you say? You don’t like beets? Well then, just leave it out. 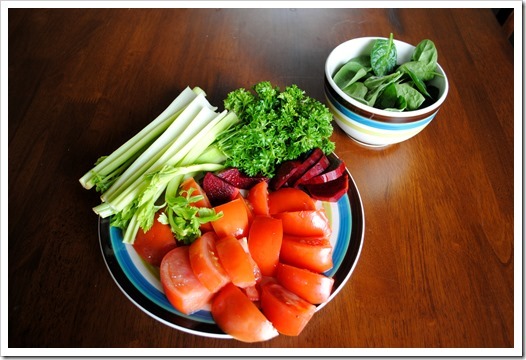 Prefer more celery because you have a lot sitting around? Go to town. You get the picture – you can completely customize to your tastes. 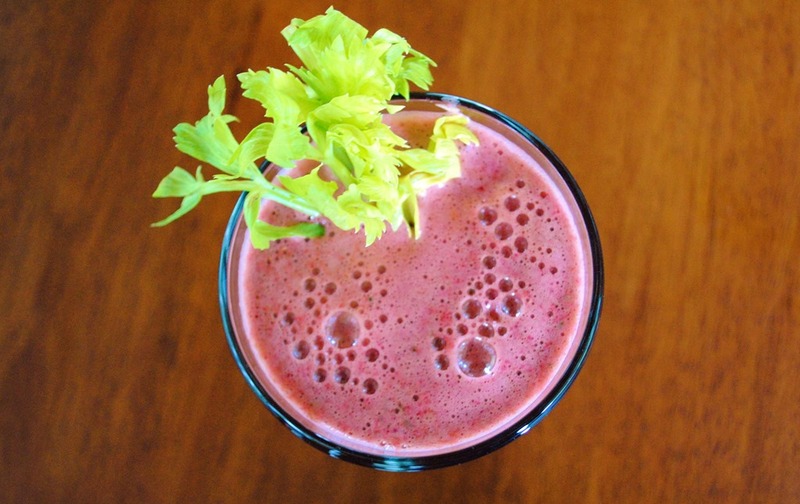 In all fairness, I should really call this a “V5 Juice,” because I didn’t use all 8 ingredients, but I’ll give you suggestions for how to get the full 8 from the original, should you wish. 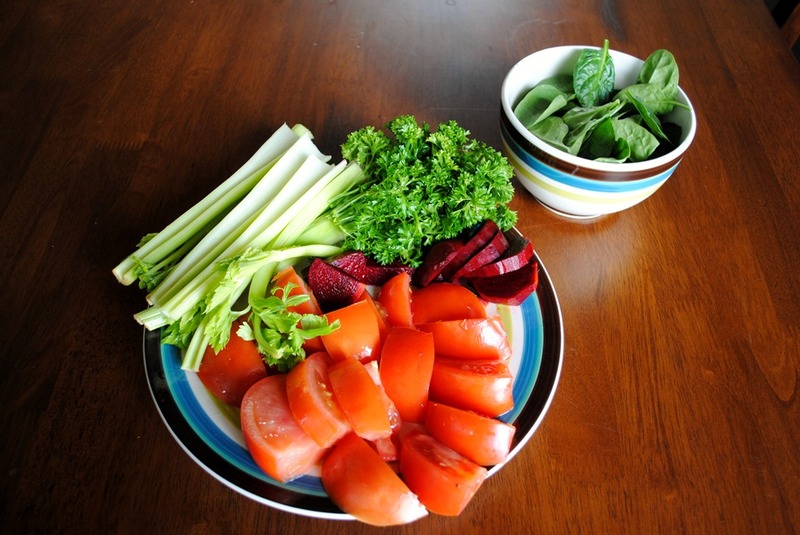 If you want the full “V8,” also add: 2 carrots, peeled, 1 handful lettuce of your choice, and a bit of watercress to your discretion. You can see that I have roughly chopped everything, and this is mostly to ensure it will all fit in the pitcher. I did not seed the tomatoes. 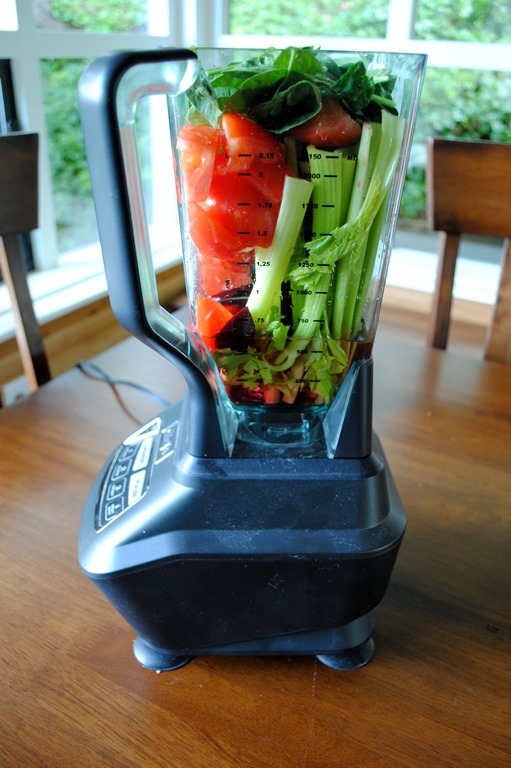 Add all ingredients to the 72 ounce pitcher of your Ninja Blender. If you have a Ninja Pulse, I would make two batches, or split the volume of ingredients in half. Pulse 7-8 times to incorporate all the ingredients. Then, blend on “3” for 30-60 seconds until well incorporated. If you didn’t add ice and prefer no pulp (the way I’m illustrating), strain using your preferred method. I use a mesh strainer over a bowl. Many people have found success with nut milk bags as well. This recipe yields about 24-28 ounces of juice and 2 cups of pulp, depending on how aggressively you strain. Don’t throw away the pulp! You can make pulp crackers with the leftovers! I drank this before a bike workout, and I have to say, I had one of my best workouts this spring after it. Thank you for this great recipe. Just what I needed. I will go ahead and make it today for the first time, and hopefully many times hereafter. One question: As I am also very interested in the pulp crackers. I never heard of dehydrating food sheets. Where do I get them? Preferably right here in a local store ? Bed Bath and Beyond perhaps? You can get the jelly roll sheets where they sell dehydrators, so I would try Bed Bath and Beyond for sure, and perhaps Target. I bought mine from Amazon. Good luck! Angela – Just to be sure, I just need the sheets, not an actual dehydrator, right? One more time, sorry. I have zero knowledge when it comes to dehydrating. They are in stock at REI; they are plastic though? Sorry, I thought you had a dehydrator already. You’ll need a dehydrator and the sheets. Each dehydrator brand has a slightly different shape, so, if you want to get into dehydrating, pick out your dehydrator first and then buy the jelly roll sheets (which are indeed plastic). Don’t use dehydrator sheets in your oven – they’ll melt! If you want to make juice pulp crackers in your oven, put it to the lowest temperature and spread the pulp out on a cookie sheet. You’ll have to play around with the time required, but it will probably be only 20-30 minutes. I like to dehydrate the crackers because the dehydrator uses so much less power than the oven. When is your second book coming out? That did help a lot Angela! Silly me to think I could dehydrate using just the sheets. Must have been one of the ( thankfully rare) blonde moments…. 🙂 Glad to help Anne! We all have our moments! Ha, well, when I have something else to say, of course! 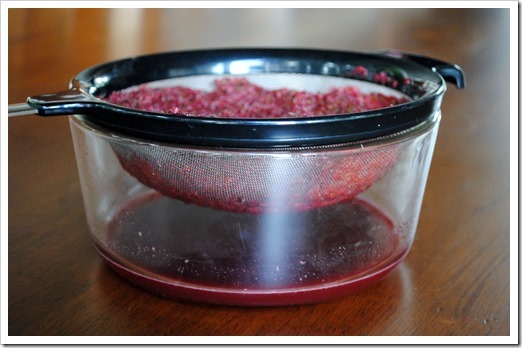 Have you tried drying foods in the microwave? I make potato chips in mine. 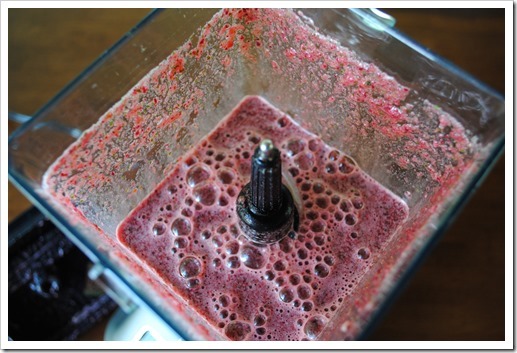 What fruits blend well in the blender? Not singly. Thanks. Can you put the rest in the refridgerator if you don’t drink it all? Are the beets you are using raw or canned? I’m using raw beets, but if you only have canned, that will work too! I nave not tried your recipe because I am already disappointed in your directions. If you know your Ninja at all, you should know that if you leave it running long enough at the highest speed (Liquify I believe) there should not be any pulp. There should just be a slightly but pleasantly thick beverage just like the original V8 that only requires some shaking or stirring before pouring and drinking! 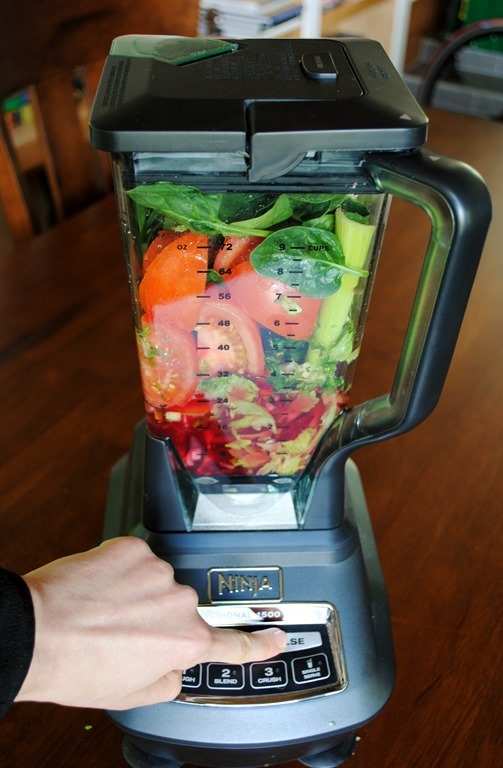 Remember a Ninja does just as good a job as a Vitamix at totally liquifying fruits and vegetables. Sorry, Rob. Have to disagree with you on this one. I know my Ninja VERY well. 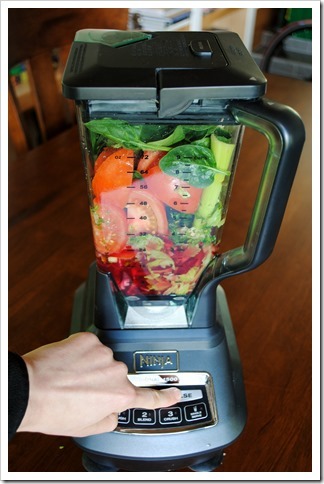 The Ninja Professional shown in this article does not totally liquefy fruits and veggies–there is much discussion all over the internet on this topic. The Ninja Ultima comes close, but the original model does not. This article was written years ago before the Ultima came out. Thank you, Angela. I appreciate the reply and I may well stand corrected as I am aware of the improvements leading up to the Ultima. I guess I will just have to try this out for myself…probably as soon as today because I have an overload of tomatoes that need my attention. 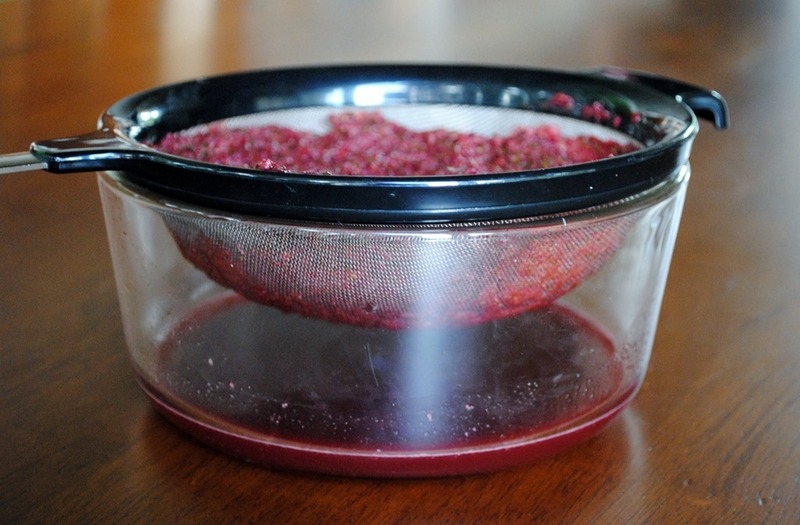 Do you use the beets raw or cook them first? How long will the leftovers last in the fridge?